Grey is a versatile colour with a plethora of hues to choose from when decorating, but by that very turn it can be difficult to get right. Go too dark and it can end up being a little too Prisoner: Cell Block H, take it too light and you could be in danger of what I call 'dishwater' coloured walls! So, imagine my delight when I happened upon this San Francisco home that uses a variation of grey hues throughout each room to great effect. As soft, sky-grey hue adorns the living room walls providing an idea base for antique furniture and accessories (that mirror? Hello!) mixed in with more modern pieces. Moving into the kitchen, the dramatic black flooring continues, a design feature that serves to connect the individual spaces. The kitchen sees a surprise addition of brights in the form of an orange standalone chair; this addition is a great way to keep interest in the scheme. Through to the dining room and again we see how old and new mix with ease: the rustic, weathered textures of the tabletop sits comfortably below the modernist drop pendant (this Industrial Bulb Pendant is similar). 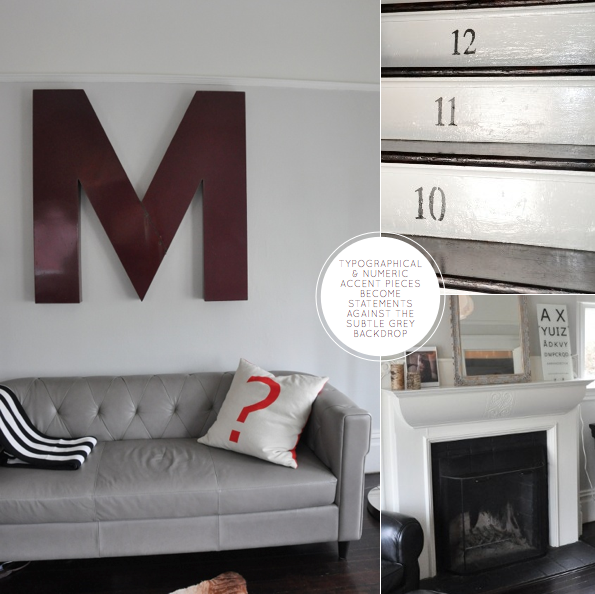 As well as the grey hues, I also like the typographical and numeric pieces, especially the numbered stairs - so fun! What do you like about this San Francisco home? This color grey is so soothing. We are crazy for the number on the stairs. Completely my style, I want to live there. Love X 3 = me. I love how they've painted the ceiling darker and then drawn the eye upwards with those bulbs. Very clever. These are the perfect shades of grey! I had so many people shudder when I said I was painting my living/kitchen space grey but I adore it and it seems to coordinate with everything. 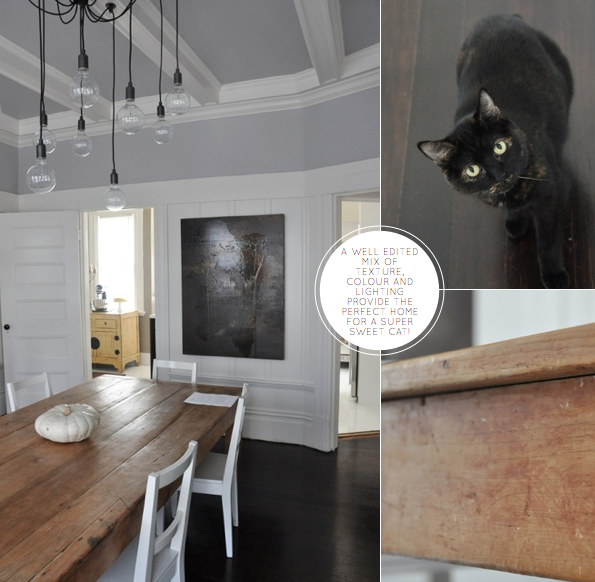 This is another beautiful example of why it's my favourite neutral! I love the industrial lighting over the table! But really the whole apartment is so stunning! I tend to put a lot of colors in a space, but lately my eye keeps going to neutrals. Great space! Hahaha, as I was scrolling through the pictures, I kept thinking it looks like a house in SF! I was right! Vindicated. :) Something about the color scheme... it's so very San Franciscan. that mirror on the mantle is incredible! would love to find something like that. I'm so keen to paint our master bedroom pale grey, with all white furniture. LOVE grey! @Chic Coles - Loving the typographical and numerical touches, too! @ourcornerhouse, Suzy, Tommy - The owners created a fab space! 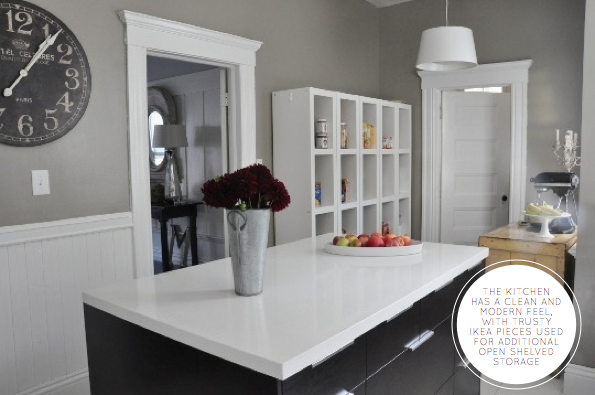 @Michelle - Isn't it amazing how a slight variation in shade can have such a big effect on the space? @Candylei - It reminds me of the table in my childhood home! @Blythe - Ditto, I've been looking for an oversized mirror for a while now. @Kathryn - Go for it! It looks so sophisticated but relaxing at the same time! That huge dining table is heaven! I'm all for the grey.. This is such a timely post. We have been stripping wallpaper in the master bedroom and a man is coming to quote on the plastering tonight. I think we're going to go for grey but gonna get some tester pots this weekend! So exciting! The grey is so chic! I love this colour! I love the light on the table come down form the ceiling: I have the same one in my home, but in yellow color! 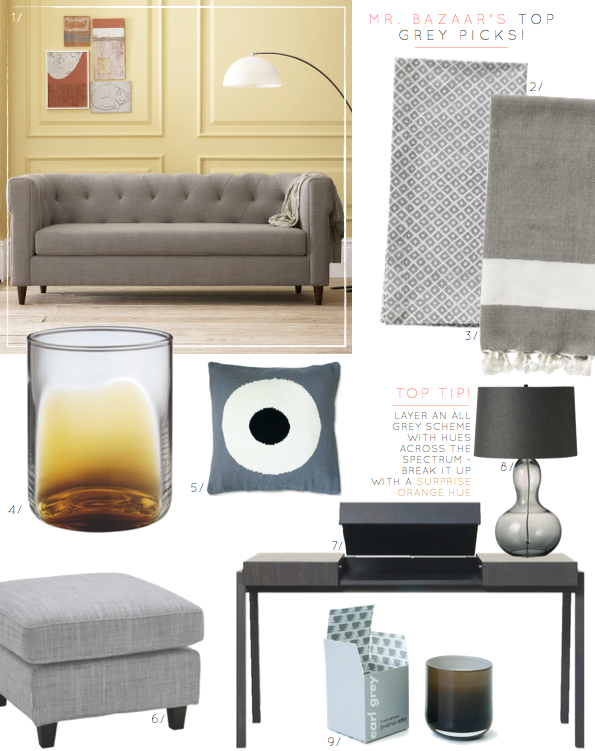 Grey gives an elegant and sophisticated tone in every room, plus it can be combined with pleanty of other colours. So true about picking the right shades of grey! But loved the orange chair - it was a nice pop of color. 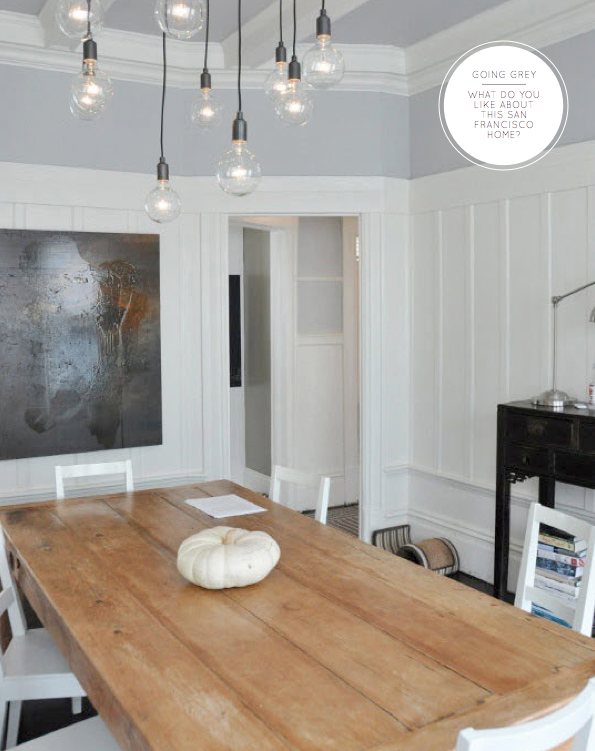 Loving the simplicity of the clustered hanging light bulbs in the dining room ... treś chic! Will!!! I am absolutely in love with the Chinese cupboard with the Kitchen Aid!!!!!!! Fabulous!! And I love grey! 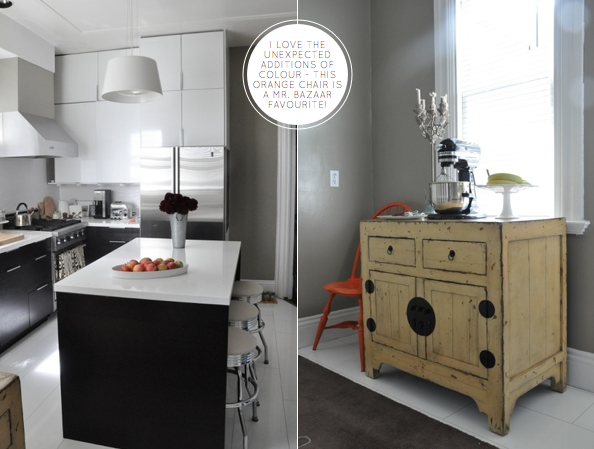 This looks a lot like my home...I love grey! Love this home. Grey is always ok with me. And those numbered stairs are always my favorite! I really like the mix between modern and rustic. And the art! Art is something I always struggle with. Still haven't found something I've fallen in love with for our own place. 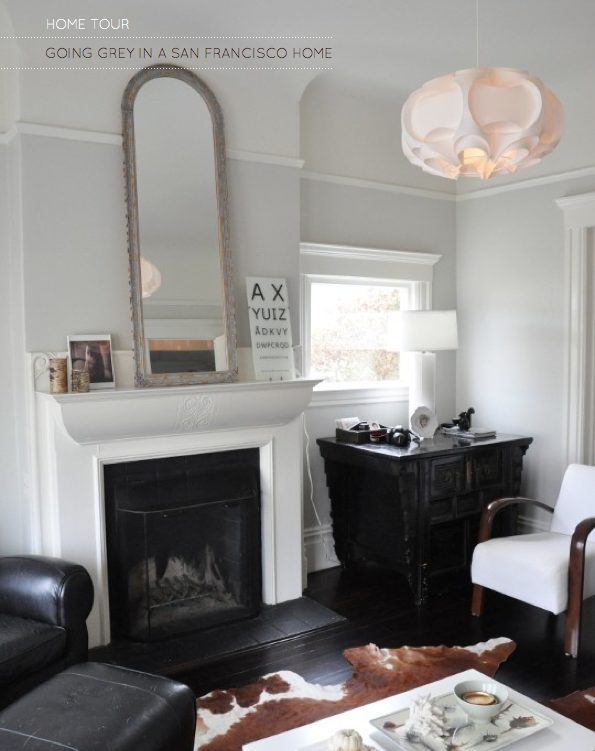 Grey walls + white trim is my favorite! Grey is hard to get right though. I spent last weekend painting over the horribly wrong shade of grey in my bedroom. Those greys are perfect shades. Wish the names of the colors were listed. Grey can be tricky. I am swooning over all the light fixtures in this gorgeous home especially the first one!